Bottom Line: Wake up. Go to Work. Suffer with a stiff neck. End the night with a headache. Repeat. Hopefully, this doesn’t sound familiar. But for millions of people this is their daily cycle. The good news? It doesn’t need to be that way. Studies have shown that people who utilize chiropractic care can improve the range of motion in their neck and also decrease the severity of their headaches. Why it Matters: New research from the Journal of Chiropractic Medicine indicates that chiropractic care may be the most effective way to get rid of tension headaches. The researchers found that patients who sought chiropractic care had a significant decrease in the frequency and severity of their headaches. These patients also saw improvement in the range of motion of their neck. This helped them have a higher quality of life, with less pain and better overall function! Next Steps: Do you know someone who sits all day at a desk for work? Our posture at work, looking at computer screens, can cause our neck muscles to become tight and stiff. 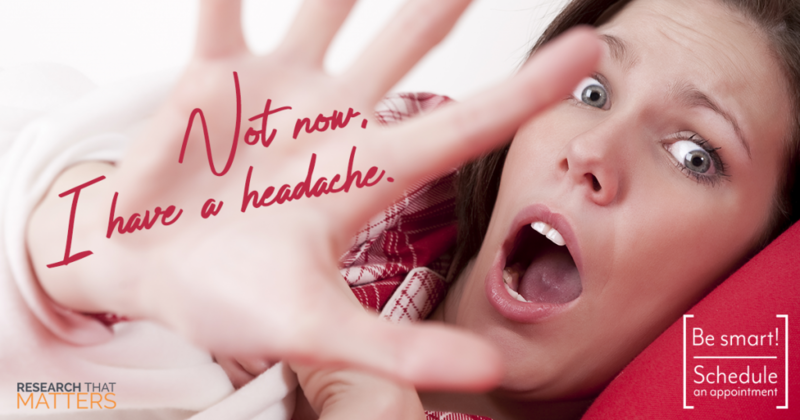 Often, this leads to tension headaches. Take this and share it with a family member who spends a lot of time at the computer and suffers from headaches. Chiropractic care may be the answer they are looking for!